Once upon a time, there was a wolf called Howler who lived in a valley where lots of fruit trees grew. Howler would often try to climb up the trees to eat the fruit they produced. But the most appetising fruit was on the very tall trees that Howler couldn’t reach. In the valley, an elderly man named Martin also had a few fruit trees that he looked after very carefully. But as he was getting older, he began to notice that he lacked the strength to pick the fruit, for it was very tiring work. Martin had some of the biggest and most delicious fruit trees in the valley, which was why Howler had his eye on them. So one day he decided to try and reach their fruit and started jumping up and down the trunk. Martin, who was looking out of the window, realised that the wolf was trying to steal fruit from his beautiful trees, but however much Howler jumped and howled, he couldn’t reach even the lowest branches of such a big tree. Seeing this, Martin had a great idea: he offered Howler a ladder to climb up, but in return the wolf would have to give him half of whatever he picked. Only then would Martin continue lending him the ladder. Howler accepted the deal and set to work collecting the fruit, and for one whole morning he went up and down the ladder filling his basket with the fruit they would then share between them. Howler soon realised that he could eat double the fruit if he didn’t have to give Martin his share, so he thought up a new, secret plan… Martin, on the other hand, trusted Howler and even began to think they would be friends for ever. 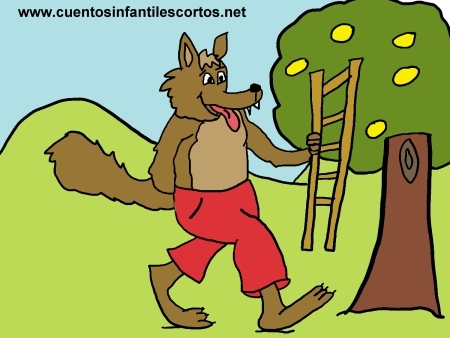 But the greedy wolf managed to rob the ladder from Martin and went off to other trees in the area for more fruit. Realising that it was missing, Martin went looking for it… found it… grabbed the ladder, and then gave Howler such a whack with it that all the fruit the wolf had eaten came flying out of his mouth. Martin felt very disappointed at the trick and no longer trusted Howler. But he still forgave the greedy wolf and they later became friends again, though he never made any more deals with him. But Howler learned that we shouldn’t trick people and that promises are made to be kept. He also learned that if he had been honest and not greedy, he would still have been able to enjoy some delicious fruit – even though it was only half of what he would have got alone.